For the Lamb, pat the lamb dry with paper towels. In a small bowl (or with a mortar and pestle) combine the lemon zest, garlic, rosemary, oil and salt and pepper and turn it into a pastel. Rub it all over the lamb. Wrap in cling wrap and refrigerate overnight. When you are ready to cook, preheat an oven to 120C. Remove the lamb from the fridge and allow to come to room temperature. Put the lamb in a deep roasting tray or dutch oven. Add half a cup of wine, stock or water. Squeeze the juice of the lemon overtop, cover and cook for six to eight hours, or until the meat is falling apart. 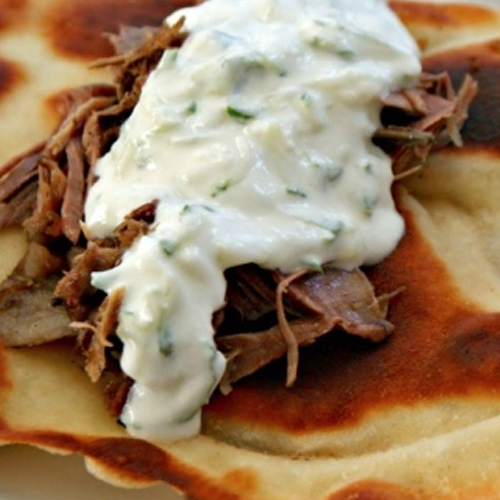 Pull the meat apart with forks and serve warm, wrapped in warm naan bread with tzatziki. For the naan - Put the milk in a bowl. Add 1tsp of sugar and the yeast. Stir to mix. Set aside for 15-20 minutes or until the yeast has dissolved and the mixture is frothy. Sift the flour, salt and baking powder into a bowl. Add the remaining 1tsp sugar, the yeast mixture, 2tblsp vegetable oil and yogurt and egg. Mix to form a ball of dough. Knead for 10 minutes until smooth and satiny (I did this in a stand mixer). Form into a ball. Pour 1/4tsp oil into a large bowl and roll the ball of dough in it. Cover the bowl with clingfilm and set aside for 1 hour until doubled in size. Punch down the dough and knead again. Divide into six equal balls. Keep covered when not working with the balls of dough. Roll the ball of dough into a tear-shaped naan, about 25cm long and 13cm wide at it's widest point, using plenty of flour to avoid sticking. Place a non stock fry pan over a high heat, and when hot shake off the excess flour and place the naan in the pan (no oil) and cook until bread puffs - around 1 minute then flip and cook the other side until it puffs. It should be slightly charred on both sides. Wipe out the pan to remove any excess flour as it will burn and repeat for remaining naan’s. In a medium bowl, whisk together 1⁄4 cup paprika, 2 tbsp. salt, chilli powder and sugar. Put steaks on a parchment-lined baking sheet; rub with the chile mixture. Refrigerate steaks overnight. 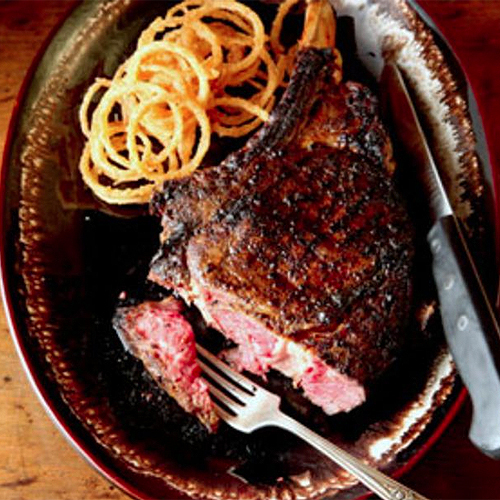 When you are ready to cook, remove steaks from fridge and allow to come to room temperature. Start to make onion rings: Pour oil into a large saucepan and heat over medium-high heat (or use a deep fryer) until 180C. Put onions and milk into a bowl; let soak for 20 minutes. In a large bowl, whisk together remaining paprika and salt, flour, chilli powder, cayenne, cumin, and pepper. Working in batches, remove onions from the milk, shake off excess, and toss in seasoned flour. Fry onions until crisp, about 3 minutes. Drain on paper towels; season with salt. Set aside. Heat a pan (or BBQ) over medium-high heat. Grill steaks, turning once, until medium rare, about 12 minutes. Remove and rest from around half the cooking time. Serve with onion rings. Mix the butter and oil then stir in the rest of the marinade ingredients. Season with black pepper. Place the lamb in a shallow dish and spoon over the marinade. Rub it all over the meat. Cover; chill overnight. Remove from the fridge 1 hour before cooking. 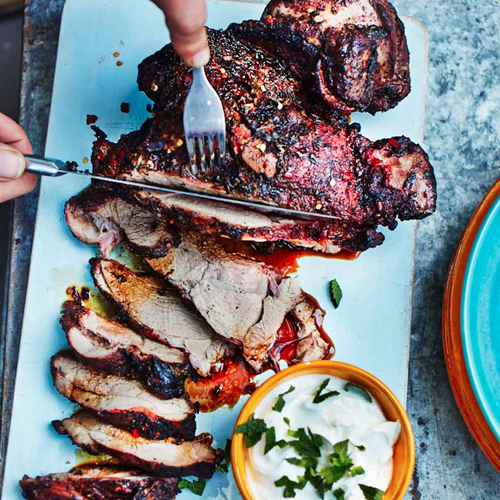 Preheat the barbecue and, once hot, add the lamb, fat-side down. Cook on a high heat for 5 minutes until golden. Turn and cook for a further 5 minutes. Reduce the heat and cook for 30-40 minutes, turning occasionally. Rest for 10-15 minutes. Slice thickly; serve with Greek yogurt and rice - or serve in wraps with a simple salad and pickled red onion - yum! Pulse the garlic, shallots, coriander, chilli, cumin, 2 tablespoons salt, and 1 teaspoon pepper in a food processor to make a thick paste. 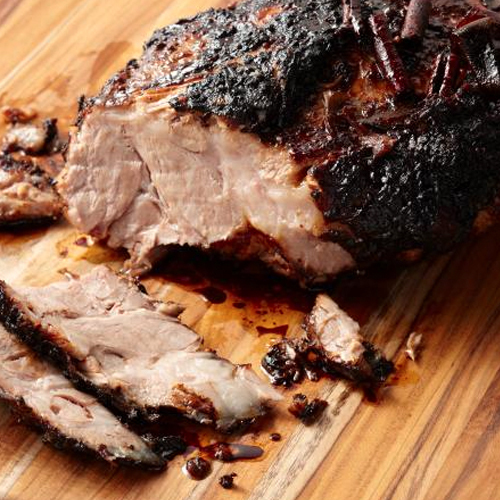 Trim the fat on the pork shoulder, leaving only a thin layer of fat. Make deep incisions with a paring knife, at about 10cm intervals, all over the meat. Rub the garlic and spice mixture into and all over the meat. Combine the lime zest and juice, orange juice, chilli sauce, olive oil, and cinnamon in a nonreactive stainless steel or glass bowl. Add the meat, cover tightly with plastic wrap, making sure the meat is submerged. Refrigerate for at least 8 hours or up 2 days. Bring to room temperature about 1 hour before roasting. Preheat the oven to 220C. Put the pork, fat-side up, in a large Dutch oven. * Roast the meat, uncovered, for 30 minutes. Add the marinade to the pot and cover with the lid. Lower the temperature to 170C. and roast for 2 hours more. Uncover and continue to cook, basting occasionally, until an instant read thermometer inserted into the meat registers 90 degrees C and the meat is a rich burnished brown, 1 1/2 to 2 hours more. Set aside on a cutting board to rest for 20 minutes before slicing. For the sauce: Strain the pan drippings through a fine mesh sieve into a gravy separator and discard all excess fat. In a small saucepan, mix the pan drippings with 1/2 cup water and bring to a vigorous boil. Slice the meat and serve with the pan drippings.